Exclusive, stainless steel (316) heavy-duty shafts: 3 & 5HP (1.25” diameter) and 7.5 & 10HP (1.75” diameter). Most other makes in the industry offer smaller-diameter, mild-steel shafts. Exclusive, oversized, double-row ball bearings: 7.5 & 10HP models. Most other makes offer smaller, single-row bearings. Exclusive, NEMA Premium-IE3 efficiency, EPACT & NRCan, 4-Pole, totally enclosed motors built by Nidec Motor Corporation (U.S. Electrical Motors). 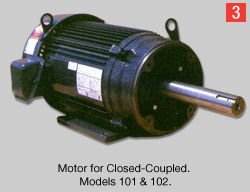 Many other makes are built off-shore and use foreign motors. *1) Dimensions in inches and weight in pounds. 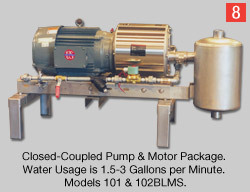 *2) Motor must be mounted minimum of 3⁄4” above base to provide clearance for pump head. W/O REC. TNK. HGHT(H) W/REC. *2) Separator/muffler connections, top and bottom: 2” OD tube. 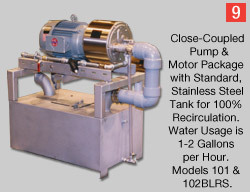 *3) Recirculation tank overall dimensions: 33(L) x 20(W) x 16(H).